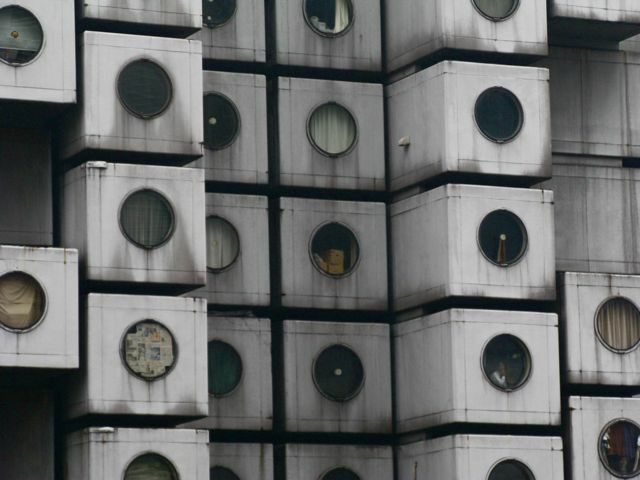 The death of Nakagin, the world’s first capsule hotel. 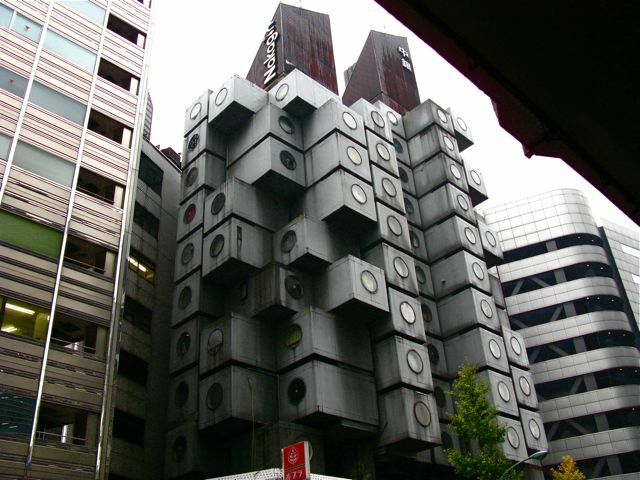 The Nakagin Capsule Hotel Tower in Shimbashi was the first of its kind in the world; a wholly modular building comprised of a concrete stack with latch-points for pre-fabricated one-piece rooms to bolt on to, with a built-in life cycle for obsolescence and upgrade. The work was the real-life embodiment of master architect Howard Roark’s vision, a character from Ayn Rand’s seminal Objectivist book The Fountainhead- a building so perfectly self-contained, ergonomic, and integrated that it would allow the whole of humanity to live in ultimate comfort with maximum efficiency- the true victory of function over form. In reality however, it didn’t work out that way. 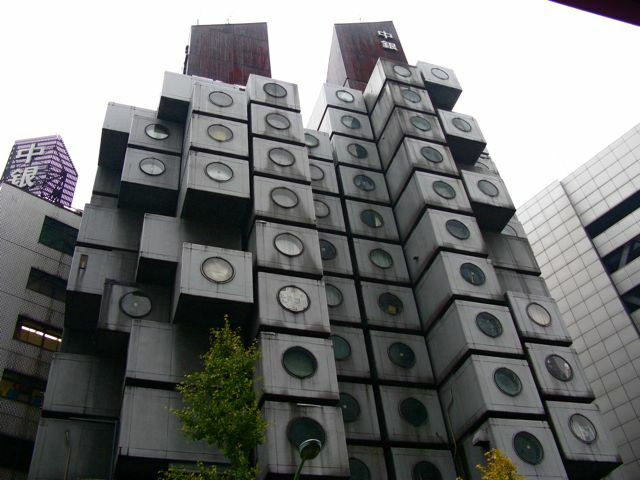 Construction finished on the Nakagin (Silver Center) Capsule Hotel in 1972, after a two-stage building process; one stage for the capsule boxes, pre-fabricated and furbished at a factory, and the second for the central concrete/steel axis, poured on site. 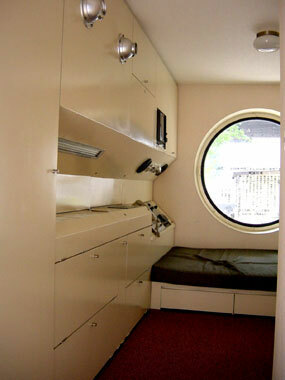 The capsules were designed to be slotted in and out as maintenance/upgrades required. Think of them like components on the Mir space station, or even like Tom Cruise’s detachable room/car in the movie Minority Report. It was a truly ground-breaking design at the time that seemed to speak to a far cleaner, more renewable future, with all of us living in such cheap production-line housing, with all our needs streamed easily through the building’s central core. However- since the 13 floors of capsules were first quadruple-bolted to the core, not one of them has ever been de-attached. Rather, they have been left to hang, and slowly falter as their systems overload and fail. They were never designed to last for extended periods. I heard from one of my students in a nearby building that the place will soon be demolished. I read on the website ‘arcspace‘ that various groups had tried to get the building world heritage status to keep it alive- but I imagine those pleas will fail. It’s prime real-estate, and will doubtless get gobbled up by some CBD-seeking conglomerate. A close-up of some of the boxes. While once this might have been intended as a hotel, it’s now wholly residential, as evidenced by the ‘No Trespassers’ sign kindly posted in English on the front doors. The view straight up the front- it’s such a weirdly beautiful building I couldn’t stop taking photos from all angles. The whole building, including the convenience store and lobby at the bottom. From a walkway, across the highway, in the rain. All the latest mod-cons built right in. It looks a bit like a Battlestar Galactica set. I went to visit the place on a rainy weekday afternoon, holding an umbrella over the camera and me the whole time. I thought briefly about attempting to enter, but the security guard inside at his desk, and a very bland lobby visible through the glass doors, plus the ‘No Trespassers’ sign just put me off. Ah well, perhaps I can return when/if it becomes a haikyo. If you like what you’ve read- why not subscribe to the email newsletter for free updates. It’s actually a pretty cool looking building. It would be nice if it could be saved but it would cost a lot to repair and refurbish it. i remember this being on Blue peter or something similar back when we lived at Blackburn Rd! Tornadoes- True, it wouldn’t be cheap, but this is living history we’re talking about. Al- Really? That is way cool, I had no idea. If this building is truly modular, then why don’t they just relocate it instead of tearing it down? Seems like since it can be moved piece by piece it could easily be dismantled and relocated. I like 1950-1970s visions of the future. Reminds me of a bunch of front load washers or dryers from the outside. Seems a little spartan in. Plush but spartan. Jason- I don’t think the problem is that it needs to be relocated- rather that it’s a hazard as it’s well past its replace-by-date, but seemingly there’s no demand for it to be replaced, so it’s just going to die off. As for truly modular or not- the capsules are modular, but the spine they’re attached to is fixed in place with poured concrete. jd- Spartan yes, it’s the whole minimalist function over form deal. I suppose though anyone living in one of them would probably fill it up with their own clutter- you can actually see some of it in the windows in the close-up shot. Thanks 2nihon, and I hadn’t noticed asiarooms’ apology for their inability to book rooms- good spot. I guess they keep it on the site because it drives some traffic to them; was the best and first image for the Sofitel on Google. Ð”Ð¾Ð»Ð³Ð¾ Ð¸ÑÐºÐ°Ð» ÑÑ‚Ñƒ Ñ‚ÐµÐ¼ÐºÑƒ, Ñ‡Ñ‚Ð¾Ð±Ñ‹ Ñ‚Ð°Ðº Ð²ÑÐµ Ð³Ñ€Ð°Ð¼Ð¾Ñ‚Ð½Ð¾ Ð±Ñ‹Ð»Ð¾, ÑÐ¿Ð°ÑÐ¸Ð±Ð¾. In English from Google- It for long searched for this [temku] so that so all competently there would be, thanks. 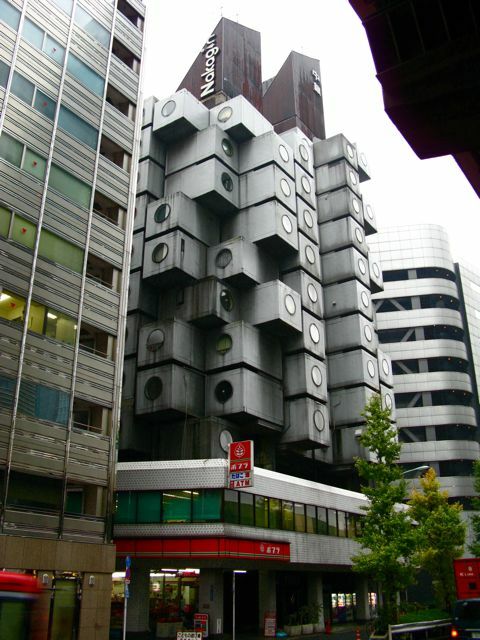 This is rather late but the architect who destined this building is trying to get the money together to move it, and preserve it has “a ideal bubble living” there was a program on one of the English broadcasting Japanese stations that I get in US about it. Lauren- Is that right? It would be cool if they could do it. It is kind of historic, but at the same time it`s perfectly reasonable that the current owner would want to make money from the land he owns. It`s good somebody is taking steps to preserve it. Dany- Hi, they`re not available as hotel rooms I think, only as apartments. Plus I doubt they`ll take on any new leasers now, with its destruction in the works. GC- I probably should have at least tried, but was feeling a bit chicken. 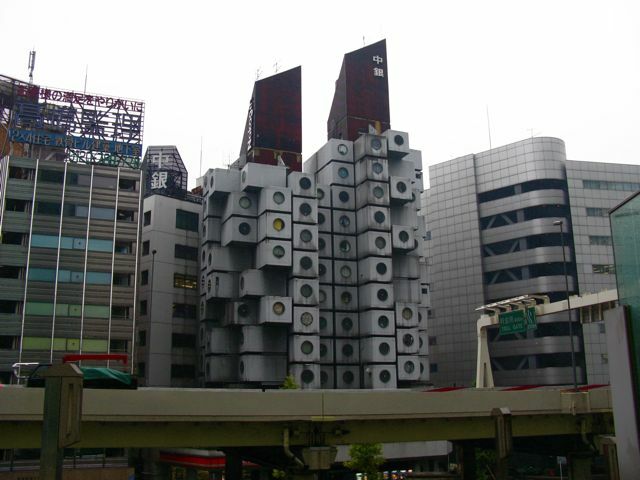 What very interesting buildings. This hotel, too bad they didn’t bother to upgrade the modules. My guess, the maker of the modules has long since moved on. 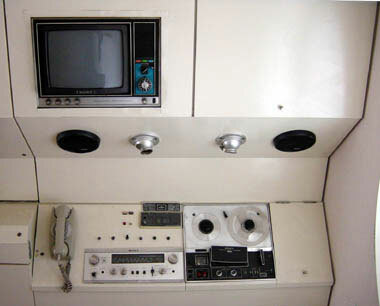 And most of the insides are gutted out – especially with the 70s era A/V hardware. I found this site looking for more info on New Sky Building from another site calling a series of photos “creepy buildings”. Only seen 2 photos of New Sky Building “like new” and it looks amazing, I wish there were some interior shots, or drawings showing the layouts…. I’m trying to figure out the design. Fascinating. Anyone know if the building is still standing? The latest news I can find is from 2007 when the condominium board voted to tear it down and rebuild over the architect’s objections. It’s definitely still there David- here’s the page of Katarina Wikars, the Swedish radio producer who visited some haikyo with me and Swedish urbex guru Jan Jornmark just a few months ago, showing his photos of it still standing. just went there few weeks ago while i stopped by tokyo for a few days. they became a apartment complex, how? not sure. theres a security sitting inside the lobby desk, so i couldnt have access inside the lobby at least. but the building is quite old, and needs a wash or paint job. That Reel To Reel Tape deck is Awesome. back again, read on a japanese blog about it recently. there still are people living there and using the space as office. 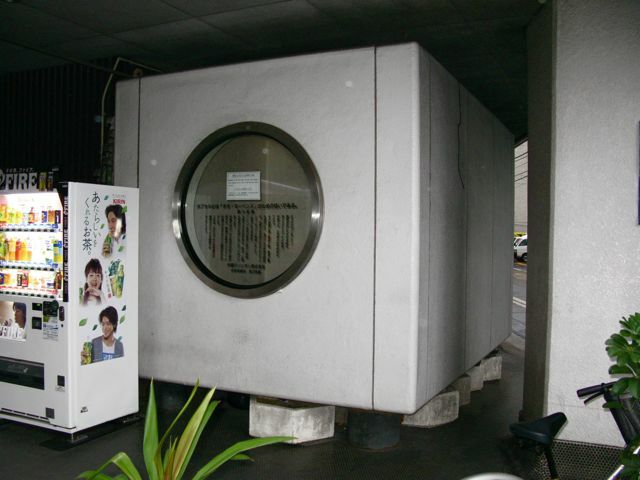 the blog mention you can buy one capsule for 300k yen. the con is that the building is aging with all typical old building issues; sewage pipes, rust. etc. After seeing it in the Wolverine movie yesterday, I remembered seeing it here a long time ago. While searching for the right link, I discovered a few other interesting pages about it.